Two experts from ENOMW team took part in the consultation meeting on Trafficking in Human Beings (THB) organised by the European Institute for Gender Equality (EIGE) in Vilnius. 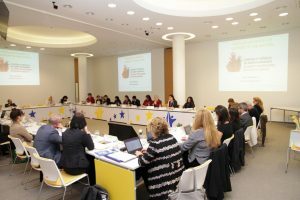 The meeting brought together over 30 experts in THB law, policy and practice in order to support EIGE’s developing recommendations to facilitate the gender-specific implementation of particular provisions of the Anti-Trafficking Directive, namely Articles 11 to 17. At the meeting we discussed how Member States can effectively implement the Directive 2011/36/EU (Anti-Trafficking Directive) and to bring into clearer focus the gender-specific needs, as well as rights, of victims of human trafficking for the purposes of sexual exploitation and forced marriage. We also addressed the barriers and challenges and potential solutions to providing effective assistance, service provision and protection to victims.